German police is yet to decide that is it illegal to drive a swimming pool? A BMW convertible first aroused the suspicions of a motorcycle cop on patrol in the eastern German town of Eibenstock when water sloshed out of it as it drove around a curve. When the officer pulled the car over, he could hardly believe his eyes. 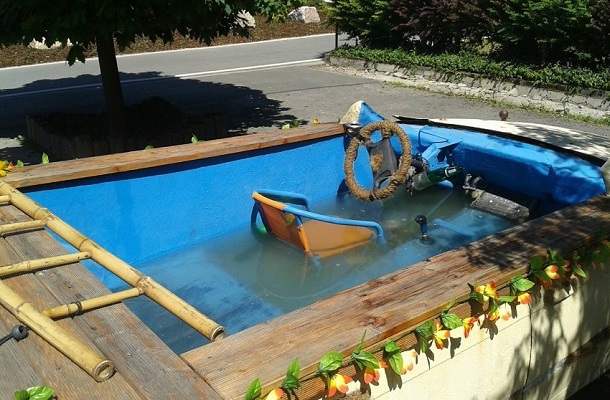 In a police report released on Monday, he described encountering an “a convertible of a slightly different kind.” The car had been converted into a swimming pool on wheels complete with a wooden railing and cheap floral decoration that could have come out of a chintzy Hawaiian hotel. In addition to the driver, the officer also found two young men sitting inside in bathing suits and a third sitting on the trunk, dipping his feet in the “pool”. The car reportedly only had one functioning gear, but could travel at speeds of up to 25 kilometers per hour (15.5 mph). The vehicle was also lacking a license plate. With the cop in hot pursuit, the men drove into a parking lot, jumped out of the car and fled the scene — likely, the officer believed, because they were drunk. Police found that the car had been sealed using synthetic material and filled with around 2,000 liters (530 gallons) of water. It attracted so many spectators that the officer had to call for reinforcements. A 27-year-old recognized by the police officer as the driver later returned to collect his belongings, but claimed he hadn’t been behind the wheel. Police had let the air out of the tires and disconnected the spark plug by then to ensure it couldn’t be driven further. The police said they let the man take his shoes and wallet but ordered a blood test to determine whether he had been drinking. Police are currently investigating possible charges for drunk driving and driving without insurance. But there’s one question that even police experts have been unable to answer: Is it illegal to drive a swimming pool?